Klout has made it easier to track subjects you are an expert in. Under the Measure button, Klout will list your top Expert Topics. You can think click any one of those topics to get a list of news stories that might be of interest to you. For example, if one were to have clicked under the Bermuda button [if that was one of your topics] this past Saturday, it would have brought up stories about Reg Grundy dying, Olympic swimmer Roy Burch, Bermuda golfing vacations, Larry Mussenden’s bid for CONCACAF president, the America’s Cup and tax havens. It makes it convenient to find stories on those subjects you are interested in. 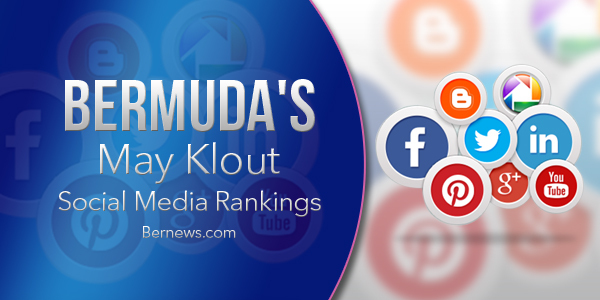 Locally, PowerGirl Trina made the biggest move in the Bermuda Klout Top 50 by gaining nine points and rejoining the top 10. Overall, there was a slight increase in scores with the Top 50 cut off point being 61 in May. WWE and FOX news commentator John Layfield remains entrenched at number one with the Bermuda Tourism Authority, and singers Heather Nova and Collie Buddz balancing out the top four. All scores were recorded from May 13-14, 2016. If you have a Klout score of 61 or higher and were not on this list, please e-mail him at dburgesspb@gmail.com or Tweet him @DonBermuda.